We are appealing to identify the rider of this red scrambler bike with ‘420’ on the bodywork. 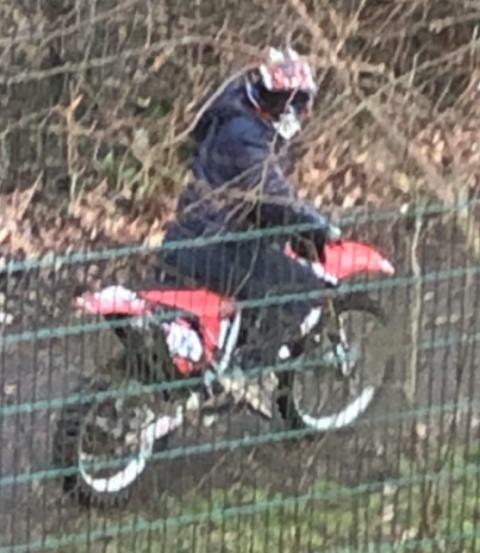 Officers want to speak to the rider in connection with a report of a motorbike riding illegally on a public footpath and revving the engine loudly. The incident took place around the outside of Oasis Academy, Lordshill, at around 1.30pm on Thursday, February 28. Southampton West Neighbourhood Policing Team run Operation Torque – an initiative to reduce motorcycle nuisance and prosecute dangerous riders. PC Simon Peacock, heading up Operation Torque, said: “We would like to identify the person pictured. “Do you recognise the clothing or the helmet in the photo? Do you know where this red scrambler bike is being stored? Have you seen this motorbike coming from a shed, a garage or a house? Anyone with information relating to this incident is asked to contact police on 101, quoting 44190072391, or call the charity Crimestoppers anonymously on 0800 555 111. Alternatively, contact the team at operation.torque@hampshire.pnn.police.uk. If you have any information about motorbikes that are causing nuisance in your community then please contact your local Neighbourhood Police Team.